In the upper lid an incision is made along over the natural crease. Excess skin and some part of the skin is removed, fat around the eye is either removed or redraped in different plane and closed with nylon stitch. In the lower eyelid the incision is placed just below the eyelashes along the eyelid margin. Fat is either removed or redraped and incision closed with a nylon stitch similar to upper lid. The ends of the stitch are taped on either end. These are removed in one week. 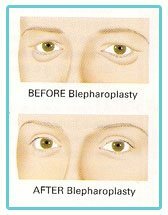 Upper eyelid procedure is usually done as local anaesthetic procedure however general anaesthesia is preferred if combined with lower lid procedure. It is performed as a day procedure or as an overnight stay. Bruising, swelling, black eyes are common after the procedure but settles down in few days, bruising may take longer to resolve. You may have blurred vision for few hours but if it persists you should contact the surgeon immediately. Your eyes may water for first few days. Eyes may feel gritty and dry for few weeks and may require artificial eye drops and ointment. Small white cysts may appear in the stitch line and this can bee treated with removing with a needle as an outpatient procedure. The risk of general anaesthesia is not common that include DVT, chest infection and pulmonary embolism. You will have bruising and black eyes that will worsen by day two. The swelling should start to settle. Nylon stitches are removed on day 5. You can wear makeup. Bruising gets paler and swelling settles further, not wear contact lenses until at least two weeks after the surgery. You could return to work. You can assess the final result now.